Perfect for every wine lover out there, whether a lover of all things white, red or rose this humorous wine bottle shaped hanging sign would make a welcome addition to any home, making every guest chuckle! This wine bottle sign is shaped suitably into a wine bottle design, painted in a jet black colour and detailed with contrasting white text and illustration. A hanging piece of rustic twine is included at the top of the piece to easily hang the sign throughout the home, be it in the kitchen, living room or even the bathroom. 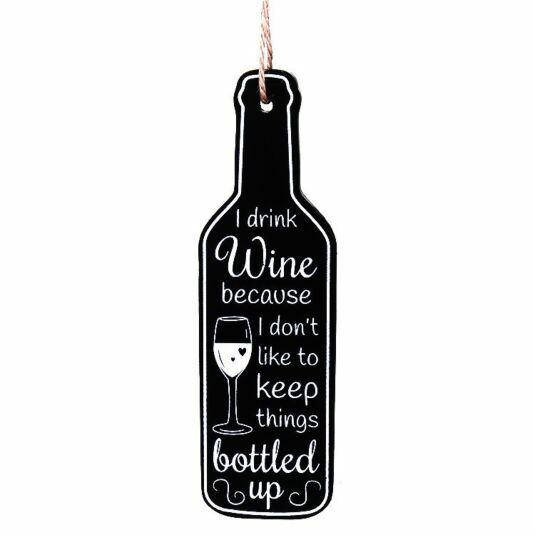 Part of a collection of 6 wine bottle signs, this Transomnia Mini Hanging Wine Bottle Sign would make the perfect gift for any lover of the fermented grape, ideal for mothers, fathers, grandparents and friends to make them chuckle and be reminded of why wine is so great!